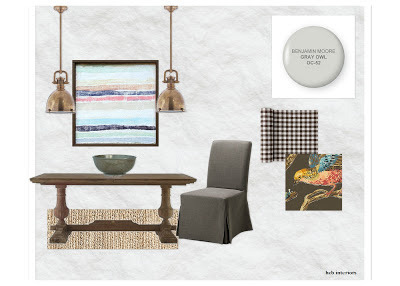 hcb interiors: Design 101 - What is Style? Design 101 - What is Style? One of the things I hear the most from my clients is that they're not sure how to define their style. Figuring out exactly what you like is a difficult task. I'll be honest - I still struggle with this. As a designer, being exposed to so many resources & ideas can give me design ADD. However, after a lot of experimentation & contemplation, I can finally discern the difference between what I actually like and what I admire as beautiful but isn't for me. Sometimes figuring out what you don't like can be just as, if not more, important as what you do like. I take issue with the magazine articles that try to define your "style" in 10 questions. First, they usually only include a few (very general) style terms: country, cottage, modern, traditional, vintage or romantic. Those terms are way too broad to be of much help. Second, how many people can actually be pigeon-holed into only one style? Even if you know that you love all things country, what type of country are we talking about? Rustic, woodsy, Americana? French or English? The 2 images above show how subjective naming a style can be - they both appear in the same post about Americana style, but one is definitely country while the other has modern touches. By the way, this subjectivity is one reason why it can be helpful to hire a designer. 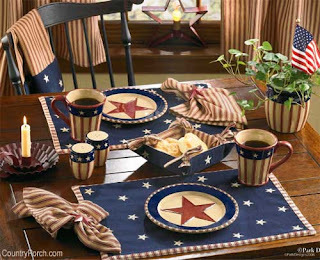 If you went into your nearest home store & asked for Americana items, which of the looks above would you be hoping to get? A designer can guide you toward your preference without a lot of costly mistakes. Oftentimes, a person's preferences will lean towards one or two major stylistic influences, with an appreciation for other types. For example, I love the cottage look, but for me, it has to be a mix of Southern traditional/prep + New England coastal with a dash of European influence thrown in. The fictional story line of my home would be a Southern belle who moves to a weathered, shingled cottage on the Nantucket shoreline & marries an English farmer. Sounds ridiculous, I know, but it also provides the perfect visual image for me to know if I will love a piece of furniture or fabric for a long time, or if it will be a passing infatuation. I can't tell you how many things I have purchased in the past because I thought I loved them, only to give them away 6 months later. I truly liked the table, chair, pillow, etc. at the time of purchase, but because it didn't fit my overall design style, I ended up tiring of it quickly. What stands the test of time for me? I designed the Keeping Room idea board below based on my list above. The basics of this room would work for me for a long time, & I could easily change out the art & fabrics with the seasons or as my tastes changed. So, how do you figure out your personal style? One of the best ways is to go through magazines (or the genius idea that is Pinterest) & tear out anything that catches your eye. Then, review your tear-sheets for any common ideas or themes. You should start to see some repetitiveness - maybe you chose a bunch of images of white slipcovered furniture or you notice that you seem to like clean lines & no clutter. This is a great way to begin your style discovery process. For even more in-depth analysis, I highly recommend taking Fieldstone Hill Design's Style Boot Camp, by designer Darlene Weir. Darlene's process of determining personal style is the best I've seen & was incredibly beneficial to me. One step of the Style Boot Camp is to create a Style Collage. I have to say, I was surprised to see what ended up in my collage (which I will share in my next post), but when I actually took the time to think about my choices, the collage I made is absolutely me - I just didn't know it! If you do participate in her boot camp & style collage challenge, please be sure to let her know I sent you! If you would like more help with the process of determining your style or with any other interior design aspect, contact me at hcbinteriors@gmail.com. I would love to work with you! Thanks for the inspiration Darlene!